LIGHTSPEED is an online science fiction and fantasy magazine. In its pages, you will find science fiction: from near-future, sociological soft SF, to far-future, star-spanning hard SF--and fantasy: from epic fantasy, sword-and-sorcery, and contemporary urban tales, to magical realism, science-fantasy, and folktales. This month's cover art is by Galen Dara, illustrating an LIGHTSPEED is an online science fiction and fantasy magazine. 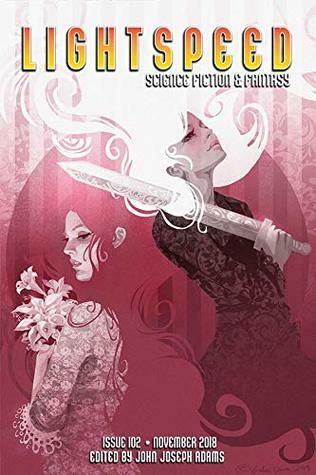 In its pages, you will find science fiction: from near-future, sociological soft SF, to far-future, star-spanning hard SF--and fantasy: from epic fantasy, sword-and-sorcery, and contemporary urban tales, to magical realism, science-fantasy, and folktales. This month's cover art is by Galen Dara, illustrating an original fantasy short story by Theodora Goss ("Queen Lily"). We also have new short fiction from Matthew Hughes ("Hapthorn's Last Case"), and fantasy reprints by Cadwell Turnbull ("Other Worlds and This One") and Sofia Samatar ("Meet Me In Iram"). We have original science fiction by Theodore McCombs ("Talk to Your Children about Two-Tongued Jeremy") and Stephen Graham Jones ("Moon Boys"), along with SF reprints by Charles Yu ("America: The Ride") and Maureen McHugh ("Oversite"). Our nonfiction team brings us our usual assortment of author spotlights, along with our book and media review columns. Our feature interview is with author Andy Duncan. For our e-book readers, this month's novella reprint is "Trinity," by Nancy Kress. We also have an excerpt from Molly Tanzer's new novel, CREATURES OF WANT AND RUIN. Another excellent issue, particularly the SF.